Naples in South Italy has a wonderful location by the sea, surrounded by the Sorrentine Peninsula and surmounted by Mount Vesuvius. The characteristic historic centre with churches, pizzerias and museums is a UNESCO World Heritage site. 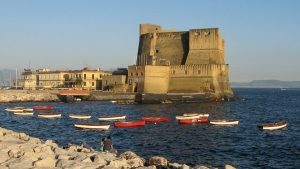 Discover the real Napoli and its historic centre with hidden churches, catacombs and a large underground city. The beautiful southern Italian metropolis is considered the birthplace of pizza – only there’s the true Pizza napoletana. Taste the delicious Limoncello, a Neapolitan caffè in a bar and the traditional sweet Sfogliatella. The harbour city and its surrounding is rich of cultural attractions and natural beauties. The archaeological excavations of Pompeii and Herculaneum are the most famous attractions in Italy. But also the still active volcano Mount Vesuvius, the beautiful Amalfi coast or Sorrento Coast and the wonderful islands of Capri, Ischia and Procida invite you to unforgettable discoveries. You can buy tickets for ferries and hydrofoils at the port Molo Beverello or online from home. There is ferry transport to many destinations in Italy, also to the islands Capri, Ischia, Procida, to Amalfi Coast and Sorrento. FAQ about ferry transport in Naples.